A solo exhibition in Unity Gallery, Fairfield, Iowa, 2016. 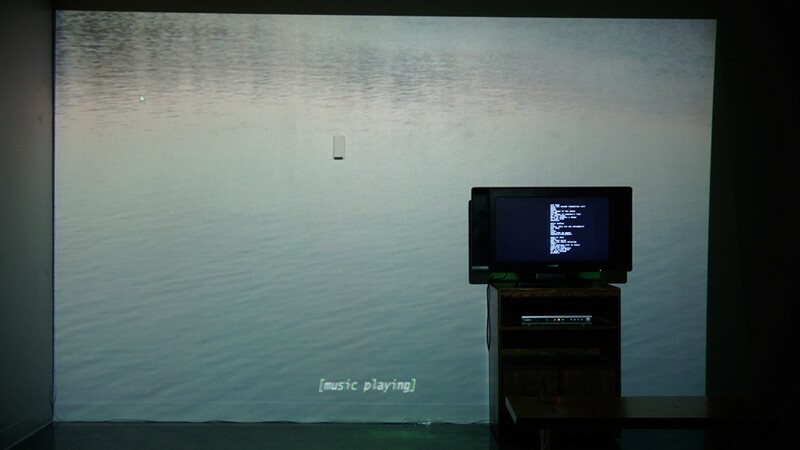 2016, oscillating room fan, triggered video projection. 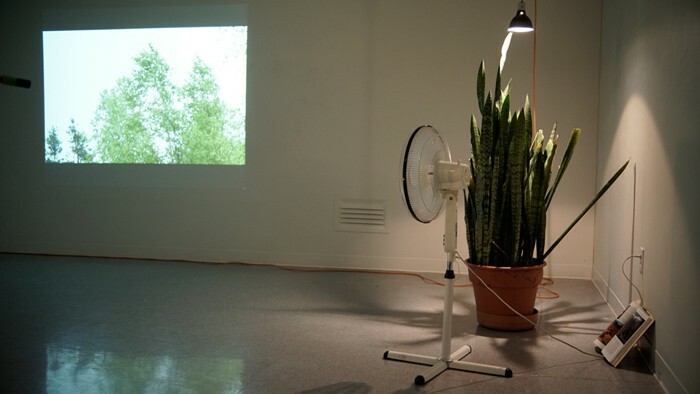 An oscillating fan repeatedly and rhythmically bends the branches of a tree projected on the wall every time it passes over. 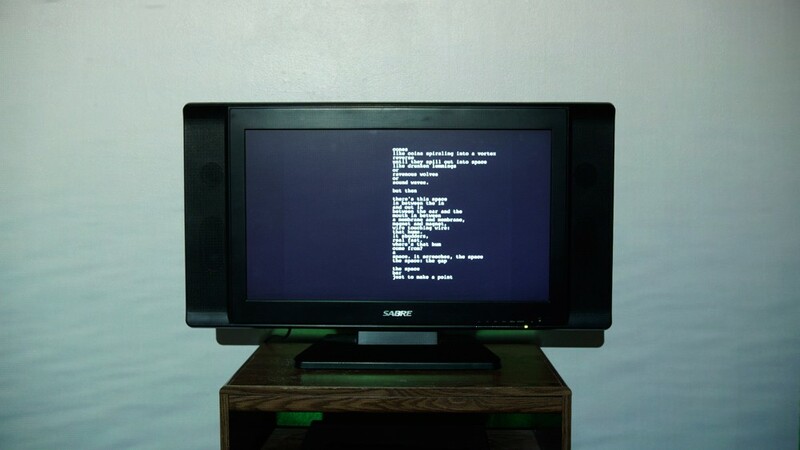 2016, television with looping text, video projection loop, wooden stand. 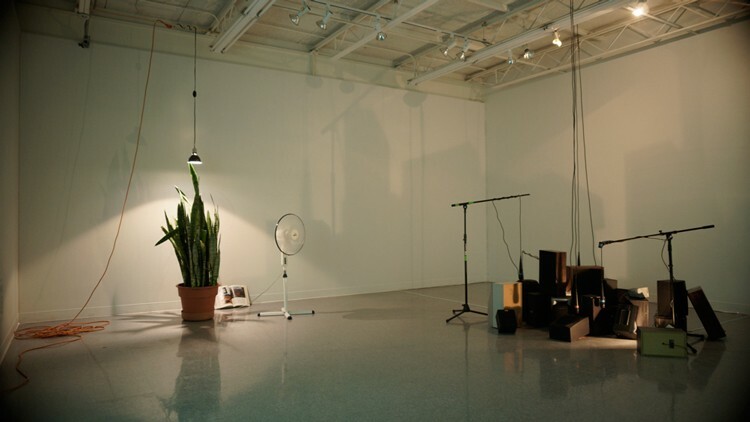 Gallery view, True Content (part one), 2016, sound installation, speakers, amplifiers, microphones, uncontrolled feedback, dimensions variable. 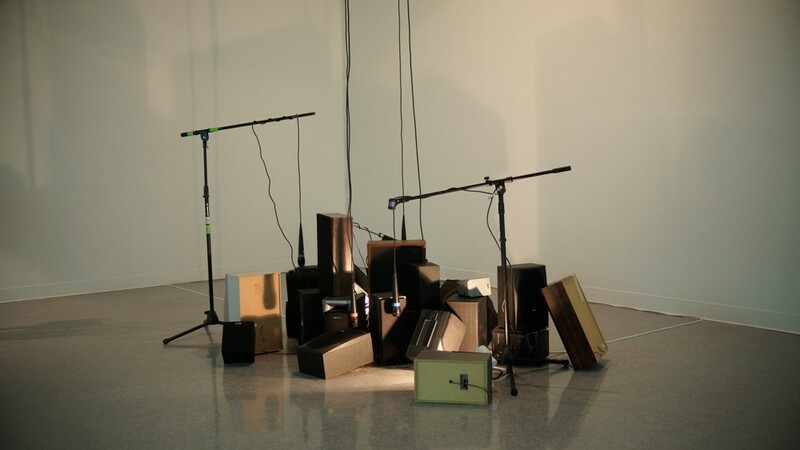 A pile of speakers, speaking to themselves, create feedback from their own internals. 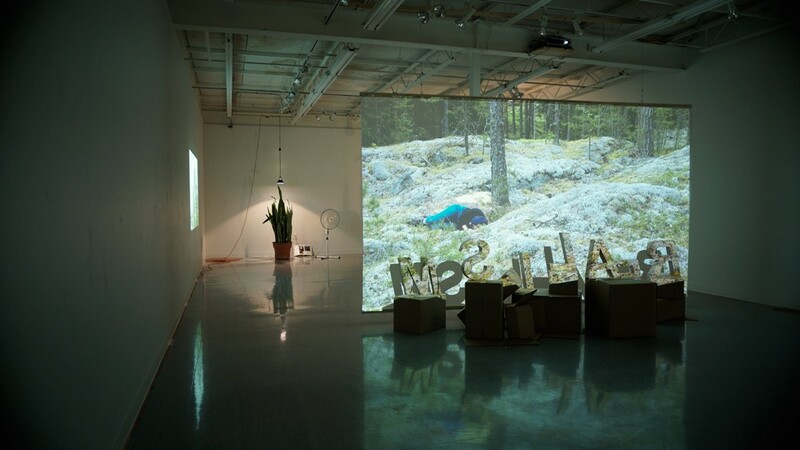 The chaotic system of the five different feedback loops responds and reacts to the amount of noise and number of physical bodies in the exhibition space. "'Ripple delete' is the name of a function in video editing software that allows you to delete a segment of some media such that the gap it leaves closes behind it. Depending on what you cut out, it can feel like something is missing, bringing together two images or sounds that don’t go together. But through their association, can create a new narrative. 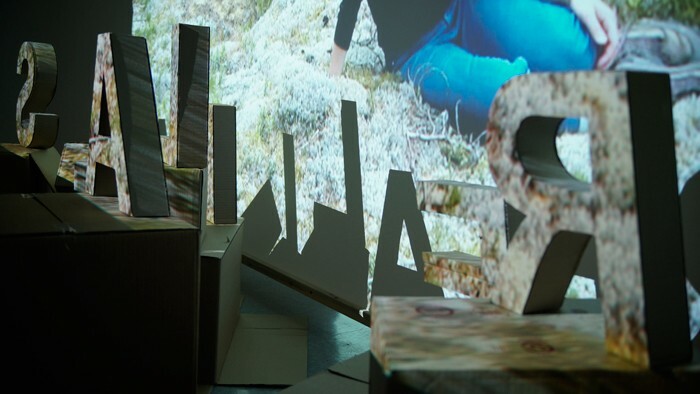 I named this show after a software function used to produce the actual work for the show--notably, the three video images of natural landscapes. What comes before an honest, unencumbered representation of a natural setting are cameras, cables, screens, wires, tripods, lumber, paint, computers, available disc space, power drills, plastic, software, various VGA adapters, internet connection speed and bandwidth, external hard drives, compression rates and video formats. All of these things, physical or abstract, play a role in the work, and ultimately become part of the subject: a whole system whose function is to capture and diffuse images. Nature is itself totally abstract and indifferent. The operative system is really it’s own true content. Like a pile of feedbacking speakers. Through nothing other than the sound of their own existence, their true content, they produce something new--a chaotic system, uncontrolled and unpredictable. This uncontrollability is in contrast to the mechanically looping videos (always predictably scenic) and the fan, reassuringly rhythmic. Seeing an image of something can change how we perceive the object itself. 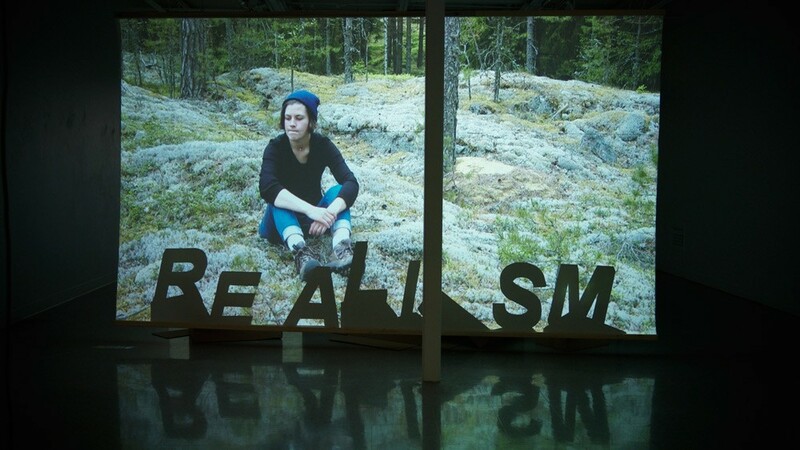 This show is also an exploration of our relationship to the natural world through images. In the occidental world, we are constantly exposed to estheticized visuals of what we’ve termed “Nature”. It has already been, for a long time, something separate from us, something exterior to daily life, a secondary, dominical activity, something to be revered and adored and conserved and photographed. Verisimilitude, as these thinkers and artists knew, was far from speaking the truth about something. Debate ensued. Eventually, that movement was replaced by another. And so on. These questions are now old, crumbling ruins, unconscious influence for how we choose to compose a photo of a misty mountain range. Questions cut out of cardboard and falling over like rocks and old speakers. The truth is an old idea, gone with the fetishism of science and scientific truth. The image of an idealized nature is broken down when there is no narrative, no intention, no action, no interaction with said landscape. Like a story, deleted. Perhaps the most honest representation is no representation at all. Only the framework once used to do the actual representing. 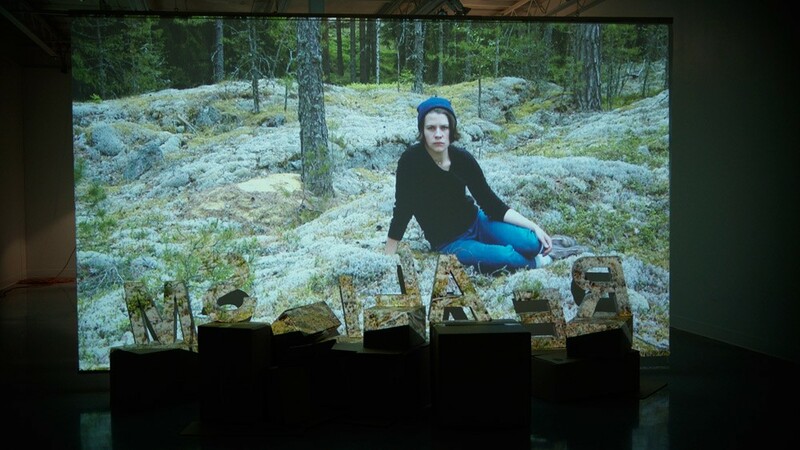 In conclusion, I would thus consider the installation with many speakers to be a more accurate portrayal of the natural landscape than most representational images we see today. -Original statement for Ripple Delete.